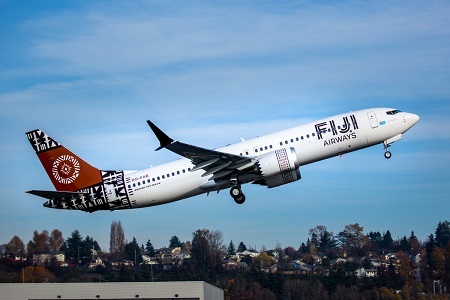 Boeing delivered the first 737 MAX for Fiji Airways during the week, which plans to use the fuel-efficient, longer-range version of the popular 737 jet to expand and modernise its single-aisle fleet. "We are thrilled to take delivery of our very first 737 MAX 8, named Island of Kadavu," said Andre Viljoen, Managing Director and CEO of Fiji Airways. "The introduction of the 737 MAX is the beginning of a new chapter for Fiji Airways and we look forward to taking advantage of the aeroplane's superior performance and economics. These new aeroplanes will enable us to offer a world-class customer experience through the new Boeing Sky Interior cabins with in-seat entertainment for all guests." Fiji Airways plans to take delivery of five MAX 8 aeroplanes, which will build on the success of its fleet of Next-Generations 737s. The MAX incorporates the latest technology CFM International LEAP-1B engines, Advanced Technology winglets, and other airframe enhancements to improve performance and reduce operating costs. Compared to the previous 737 model, the MAX 8 can fly 600 nautical miles farther, while providing 14 % better fuel efficiency. The MAX 8 can seat up to 178 passengers in a standard two-class configuration and fly 3,550 nautical miles (6,570 kilometres).